Annie Oakley joins Buffalo Bill’s Wild West Show to become an American Icon. 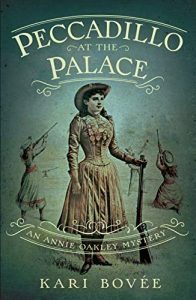 But when a series of crimes takes place during their travels, including the murder of her Indian assistant, Annie fears someone is out to get her. With the help of a sassy, blue-blooded reporter, Annie sets out to solve the crimes that threaten her good name. 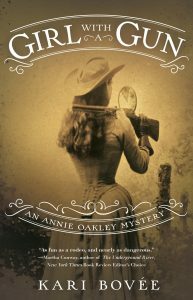 After the death of her father, it is up to 12-year old Annie Oakley to help support her mother and two younger siblings. Annie thinks she can do this at home, but her mother has other ideas. 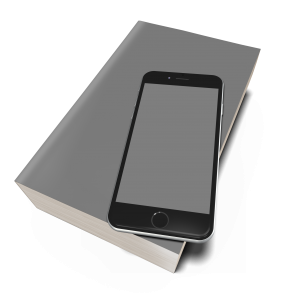 She sends Annie to the Darke County Infirmary, the local poorhouse, in the hopes that Annie can be trained to work for a loving family to help support her own. After learning the necessary skills, Annie is farmed out to the McCrimmons, a couple in a distant county, to help keep house and take care of their young infant. Ready to do her part, Annie tries her best to put on a brave face, but as soon as she sets out from the infirmary with Mr. McCrimmon, she quickly learns that life away from home is far worse than she ever expected. Suffering neglect and abuse at the hands of the McCrimmons, whom Annie refers to as the wolves, she perseveres in the hopes of helping her family. Her friendship with Buck, a beautiful buckskin horse, is the only bright spot in Annie’s life. After a harrowing night at the hands of Mrs. McCrimmon, and no word from her family or the infirmary, Annie resigns herself to a miserable life with the wolves. Either that, or she must take matters into her own hands, and escape. Annie formulates a plan, but when she witnesses Mr. McCrimmon beating Buck nearly to death, Annie decides to take action—no matter what the cost. 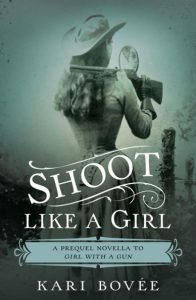 In Shoot Like a Girl, Annie Oakley experiences some of life’s most disheartening hardships only to emerge as an empowered young woman who goes on to become America’s most cherished heroine.